deSIGNery Sign Company is a supplier of high quality screen printed custom clear decals with clear liners & clear stickers with clear backs. When durability, long lasting color and exposure to the weather are a concern, there is no substitute for screen printing using UV inks. A clear liner is ideal for individual decal sales because of the added readability of face adhesive decals. Check out our Spring Sale for savings on Custom Printed Clear Stickers with clear liners and Clear Stickers in the following link. 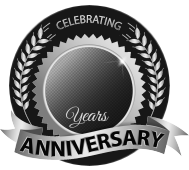 BBB Member since 2004 with a proven record of complaint free customer satisfaction on items like Custom Printed Clear Stickers with clear liners and Clear Stickers. Click on the BBB logo above to check our record or leave a customer review. At deSIGNerySigns.com we have more than 24 years experience in designs for our Clear Stickers. Call us today and let our design specialists help create your next project to promote your product or business. FREE Shipping on all decal and sticker products | Free layout | A+ BBB rating | 24 years in the business | Call Today for a free quote on Clear Stickers. Clear stickers & static clings with clear fronts are screen-printed on transparent polyester with permanent, pressure-sensitive adhesive material. White is a color on transparent decals and must be priced as an additional color. It is highly recommended that any ink on transparent material should be backed with white. Please indicate if white is to be a flood of entire decal or to back art only. If text or graphics are too thin, a halo effect may be required. This page and pricing is for face adhesive decals only. A face adhesive decal is one that when applied to the inside of a car window or other glass surface, it will be viewed from the outside. 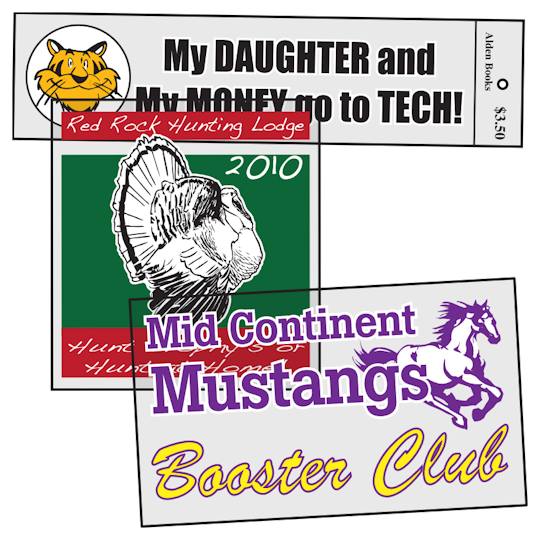 In the TECH and Mustang Booster Club examples above, if this was normal face adhesive decal with a normal liner, which is paper, the consumer purchasing this single decal would not know what he is purchasing as the face and text area would be covered with a white paper product and the back would in most cases be white. If the clear decal with clear liner is used for fundraiser, it is much easier to sell when they can see the beauty of the decal. If this product is for your personal use or something you are sending to store managers to put up on storefront windows, cooler doors or other glass surfaces, you do not have to spend the additional money for clear liners. If you have any questions about clear liner stickers, contact us and we will recommend the product that will be most economical and will work for you.